Carving Knives: Will Vulnerable Vermonters Survive Budget Cuts? As grandma prepared the stuffing last Wednesday, Gov. Peter Shumlin's administration was busy cooking up a heaping helping of bad fiscal news. The day before Thanksgiving, Commissioner of Finance and Management Jim Reardon announced that the administration would cut another $17 million from this year's budget. The move came just three months after legislative leaders signed off on another $31 million in midyear cuts. The latest round of rescissions wasn't unexpected. In the first four months of the fiscal year, General Fund revenues clocked in at nearly $12 million — or 2.7 percent — below expectations. Since early last month, Shumlin had been hinting that more cuts were in the offing. Precisely which programs will be targeted isn't yet clear. Agency and department heads have until Friday to submit their recommendations to Reardon's office. But one thing is certain: Any turkeys pardoned this time around will be back in the oven come January. That's because the state is already expecting a $100 million gap in next year's budget — and, after a decade of tough choices, lawmakers are running out of options. If the burgeoning debate over how to fill Vermont's perennial budget hole has you feeling a bit of déjà vu, you're not the only one. "The conversation about the budget is always, 'Is it up? Is it down? We're spending too much. We're not spending enough,'" says Paul Cillo, president and executive director of the Montpelier-based Public Assets Institute, a left-leaning think tank. "There's just been this manage-to-the-money idea, where if you're focused on the money, you're not focused on outcomes. You're not focused on what you can accomplish." Cillo, a former House Democratic majority leader, points to the trouble-plagued Vermont Department for Children and Families as an example. For years, the child welfare agency has been underfunded and understaffed, he says. After two young children under DCF supervision were allegedly killed by family members last February and April, the agency was criticized for being — you guessed it — underfunded and understaffed. "We heard this language in the recession of 'doing more with less,'" Cillo says. "And then, when we find out that we're doing less with less, we're really surprised." Two recent reports requested by the Shumlin administration make a similar point: that state government isn't adequately serving Vermont's most vulnerable. After a lengthy review of the two child deaths, the Vermont Citizens Advisory Board issued a brutal report a week and a half ago criticizing the state for failing to protect children who were clearly suffering from abuse. The independent panel, appointed by the Shumlin administration, included health care workers, child advocates, legislators and a former judge, among others. "It is clear that all agencies within the child-protection system are carrying case-loads that are too high, which causes workers to triage, to burn out and leave, and to cut corners in an effort to do the best they can," the report found. It blamed "legislative funding cuts in the past decade" for a decline in quality control at DCF, and said that the 18 new positions added last summer "will not fully address" its high-caseload ratio. The other recent report, released a week earlier, came from the Governor's Council on Pathways From Poverty. Composed of 30 low-income advocates, the group was formed in the aftermath of a bitter 2013 confrontation with the administration over recommended welfare cuts. Last month, the council presented Shumlin with a 19-page proposal that began with this bleak assessment: "Poor Vermonters, including families with children, are in crisis." The report is a wish list of expensive investments in housing, transportation, employment and safety net programs. But recognizing that "revenues are not robust," the council also offered a shorter "menu" of programs it said would be affordable and highly effective. "Our hope would be that we'll see some of these recommendations be illustrated in the governor's budget," says Christopher Curtis, the council's cochair and an attorney with Vermont Legal Aid. Among the group's highest priorities? Investing an additional $500,000 in the $1 million Vermont Rental Subsidy Program, which helps low-income Vermonters pay for housing. Curtis argues that the program "goes a long way to solving our homelessness problem" while avoiding costly, state-sponsored motel vouchers. Other top priorities include increasing funding for low-income weatherization, the Reach Up welfare program and childcare assistance. But wait: Shumlin's budget writers are having a hard enough time maintaining existing funding levels. Is it realistic to expect the governor to heed the recommendations of his own poverty council? "The governor met with the council when they released the report," his legislative liaison, Sue Allen, said in an emailed statement. "Their perspective and input will be appreciated as the administration and lawmakers make spending and policy decisions in the coming session." Shumlin has indicated in recent weeks that he's disinclined to raise taxes to fill the budget hole or fund new programs — except, of course, for his massive health care reform proposal. And House Speaker Shap Smith (D-Morristown) agrees. "My view is that we need to look first at where we can reduce the amount of spending and then, if at some point in time we think we cannot get there, then we can look at revenue," Smith says. "But that's not our first option." The speaker adds, "I think we're going to have to ask the question: Are there things we've done in the past that we can no longer afford to do? I don't know the answer to that question." The way Curtis sees it, if lawmakers choose to cut services instead of raising revenue, "That's effectively a tax on the poor." "I hope that in the discussions around the budget that everything's on the table," he says. "This state cannot afford to continue to fight budget deficits with one arm tied behind our back." In his first showdown with the legislature since he narrowly won reelection last month, Shumlin appears to have blinked. For the past few weeks, tensions have been building between the administration and members of the Joint Fiscal Committee over whether the governor can impose a second round of midyear budget cuts without legislative approval. The conflict surrounds a vague statute governing who can cut the budget when revenues are down and the legislature is not in session. Typically, Joint Fiscal, which includes the leaders of the House and Senate taxing and spending committees, must approve any cuts greater than 1 percent of the budget. The administration can act on its own if revenues look likely to drop by less than 1 percent. In August, when state economists downgraded revenue estimates by $31 million, Joint Fiscal signed off on $22 million in General Fund cuts, plus another $9 million in transfers and other adjustments. But now that the administration believes it needs to pull back on another $17 million in spending, it wants to make $6.7 million in immediate cuts — without Joint Fiscal's approval. Senate Appropriations Committee chairwoman Jane Kitchel (D-Caledonia) and retiring House Appropriations Committee chairwoman Martha Heath (D-Westford) say that's not kosher. Smith, the House speaker, agrees with them. "I don't think the authority they think they have is the authority that they do have," Smith says of Shumlin and company. While legislators agree that cuts need to be made, Heath says, "We should not cede our authority to the administration." The legislature's lawyers have their backs. A memo prepared by the Office of Legislative Council argues that, "it is unlikely that the [administration] has authority to implement a rescission plan in FY 2015 without JFC approval." But Shumlin produced his own legal memo — this one drafted by Chief Assistant Attorney General William Griffin — that comes to quite the opposite conclusion. Since the total General Fund reduction from both rescissions would be no greater than the agreed-upon drop in revenue, he argues, the administration is within its rights. As of Monday morning, Shumlin appeared to be sticking to his guns. 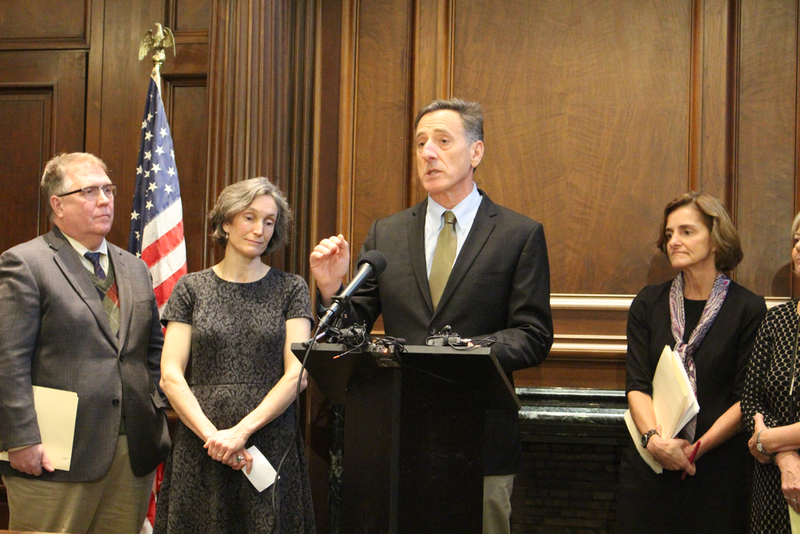 "We have no doubt about the authority that we have to implement the recommendations that we've made to our commissioners and secretaries," Shumlin said at an unrelated press conference in Montpelier. He argued that the longer he waits to make the cuts, the steeper they'll have to be. "So we are doing what is both legal, prudent and right for Vermont taxpayers," he said. By the end of the day, though, the administration had changed its tune. "We are not going to use our statutory authority to reduce appropriations now," Secretary of Administration Jeb Spaulding said Monday evening. Instead, he said, the administration will ask agency and department heads to "slow down spending," but will hold off on cuts until the legislature reconvenes in January. "It just isn't worth the distraction," Spaulding said. "We've got a lot of work to do and don't need to have an unnecessary conflict with the legislature at this point." Is there really a difference between "slowing" spending and "cutting" spending? "It's a pretty subtle difference there," Spaulding conceded. "If we are fighting over a matter of principle, that's not as important as getting the job done." Heath, at least, appeared to be satisfied with the result. "We have bigger problems to deal with," she said Tuesday. "It isn't worth starting off with a disagreement." Two weeks ago, Shumlin shuffled three top aides to new positions within the governor's office, but he has yet to announce who will fill two of the most important jobs in his administration. After firing secretary of human services and onetime political rival Doug Racine in August, Shumlin temporarily assigned Commissioner of Health Harry Chen to the post. Shumlin has said publicly that he hopes Chen will stay put, but it's unclear whether the former House Democrat and emergency room doctor is interested. "Out of respect for the [organization], all I can say is 'stay tuned,'" Chen said Tuesday. An even bigger question is who will replace Spaulding as secretary of administration. A former state treasurer and senator, Spaulding has vast authority over budget and policy matters, and has served as almost a co-governor with Shumlin. He's leaving in January to become chancellor of the Vermont State Colleges. Montpelier insiders have been speculating for months about who could fill Spaulding's shoes. Among the names floated have been Shumlin's chief of staff, Liz Miller, his health care czar, Lawrence Miller, and a slew of cabinet officials, such as Deputy Secretary of Natural Resources Justin Johnson, retiring Secretary of Transportation Brian Searles and Secretary of Agriculture Chuck Ross. Says Spaulding, "The governor's working on a short list, and I hope he has a decision soon." The Vermont Republican Party has hired its first executive director since March 2012. The GOP's executive committee named Jeff Bartley to the post Monday night, as Vermont Political Observer blogger John Walters first reported. Bartley previously worked on the doomed U.S. Senate campaigns of Republicans Rich Tarrant and Len Britton and has served as the state GOP's "victory campaign director" since June. He famously sued Britton over unpaid wages after the candidate lost to Sen. Patrick Leahy (D-Vt.) in 2010. "I'm confident he'll transition well into this new role," says party chairman David Sunderland. Bartley says he's "excited for this new chapter" and to build on the party's successes in last month's legislative races — and Republican Scott Milne's near-defeat of Shumlin. "We made some gains, but it's time to stop celebrating and get back to focusing on 2016," he says. The original print version of this article was headlined "Carving Knives"